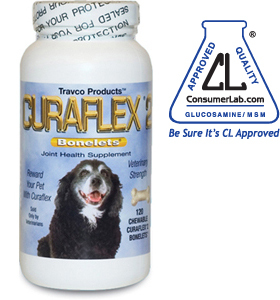 Curaflex 2 is a specially formulated tablet to help maintain healthy joint cartilage, which is important in keeping your dog active and mobile. is a natural compound found in the body that has been shown to stimulate the body’s ability to maintain healthy joints. is a source of organic sulfur, a nutrient found in your pet’s body which is used in the support of cartilage. For pets over 100 lbs., initial administration is 4 chewables daily. After response is noticed, usually within 4 to 6 weeks, gradually lower number of chewables to a level that maintains your pet. The number of chewables can be increased at any time based on your pet's needs.